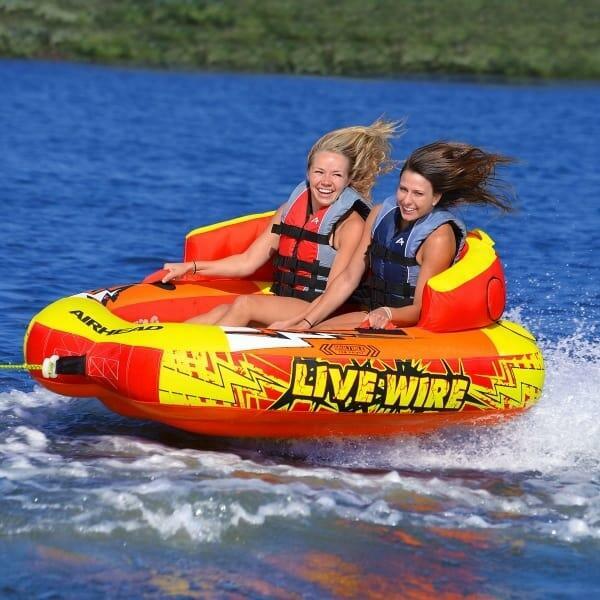 The Airhead Live Wire 2 Rider is one inner tube in a family of high quality tubes backed by the Kwik Tek and Airhead names. The Live Wire 2 Rider comes from a collection of Live Wire inner tubes that are wildly popular for their inventive design. There are two tow points on opposite sides of the tube, and depending on where you hook the towrope, each direction provides a completely different experience. When towed from one direction, riders kneel side by side, and when towed from the other direction, riders sit upright, supported by a comfortable backing. The Live Wire is meant to withstand heavy use for multiple seasons of use. It is created with a heavy gauge RF welded vinyl bladder and is fully covered with a double stitched full nylon cover. Riders get tired of the same old donut shaped thrill. Give them the option with the Live Wire 2 Rider by Airhead.